Join Us!!! We are looking for someone to help us cover Mauritian basketball. Please send us an e-mail. Gendarmerie Nationale Basketball Club overcame Real Club 104-71 to advance to the semifinal of the Coupe des Clubs Champions de l'Ocean Indien. The team from Madagascar dominated the whole game and rightfully clinched the place in the top 4. Constant Mandimbison stepped up with 28 points, while Henintsoa Ramaromanana (86) and Alpha Solondrainy had 15 each. Josiah King replied with 22 points in a loss and Jean Louis Joey Gerie netted 13. 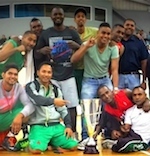 BCM Mayotte earned the Indian Ocean Club Championship Cup trophy. They overcame PLS Hawks 72:59 for the trophy. 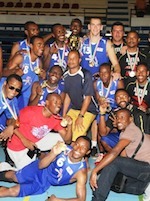 PLS Hawks had to win by six points to bag the title but BCM Mayotte lived up to the challenge. They dominated throughout the encounter posting a well-deserved win at the end. Ouirdane MLadrou scored 20 points to lead the winners. Chebani Ahamed added 18 points, while Vladimir Buscaglia (197-SF-80, college: American) netted 15 points and pulled down 12 boards in the victory. Timmy Adam responded with 15 points for PLS Hawks. John Bernard tossed in 11 points in the defeat.